Music industry groups that banded together to help overhaul U.S. music copyright law are now working together on a new system to distribute billions of dollars in digital streaming revenue. The coalition of groups plans to propose a vision for the collective envisioned under last year’s Music Modernization Act to ensure that royalties from music streamers such as Spotify flow to copyright holders. If approved by the U.S. Copyright Office, the proposed Mechanical Licensing Collective would be the linchpin of the new law. The law mandated creation of the collective to cope with a digital streaming subscription model that has emerged to dominate the music business. 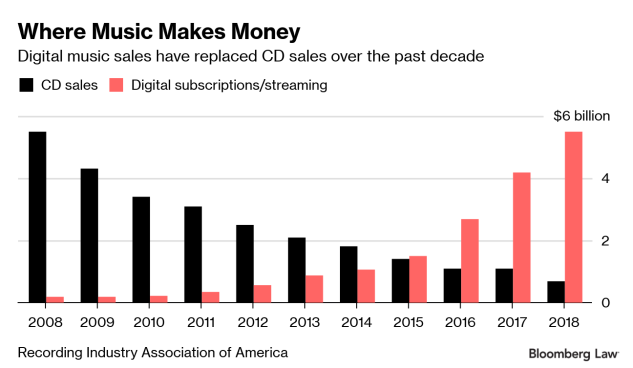 Existing law had fostered an unmanageable combination of rights acquisition, copyright lawsuits and unpaid royalties despite rising revenues that now account for more than half of the music industry’s revenue. The National Music Publishers Association and two songwriter groups say an overwhelming share of the music industry endorses their plan. The coalition will send its blueprint for designing and implementing the collective to the U.S. Copyright Office by March 21, the deadline for proposals. But a rival group says the coalition’s structure for the collective—and resulting conflicts of interest—would continue empowering industry giants at the expense of independent artists. Some complaints about the proposal are baked into the law, such as the criteria for choosing the collective’s board of directors. But the opposition evokes long-standing mistrust within the industry over royalty distribution. Bart Herbison, head of Nashville Songwriters Association International, which is part of the coalition, dismissed the objections. He said the coalition’s proposal will likely be the only one that meets the law’s requirement of broad support. The public will have until April 22 to comment on proposals, which will be posted online by the Copyright Office. The office, which declined to comment on the proceeding, has until July 8 to select the proposal that best meets the law’s requirements of being an independent nonprofit supported by copyright holders that can carry out the law’s mandates. Digital streamers facing a flood of copyright lawsuits sought a blanket license for the rights needed to sell cassettes, CDs and now downloads in 2017, to avoid dealing with individual rights holders. Artists and publishers backed the concept, hoping to cut litigation costs and open the door to rising revenue from music streaming sites. Their proposal became law a year later. The Music Modernization Act included new copyright protections for pre-1972 music and boosted royalty payments for producers. The licensing collective is the centerpiece of the new law. The collective not only must collect and distribute royalties but also establish and maintain a free, public and searchable database of musical works to help match streamers’ usage data with the rights holders. Coalition leaders say their proposal for the collective will do those things. The law also calls for a voting board of directors representing 10 different publishers plus four independent songwriters, along with non-voting members and other committees. The coalition has released its selections to fill those seats and listed dozens of endorsements on its website. They include trade organizations, large and small publishers, performance rights organizations, songwriter groups, digital performance royalty collective Sound Exchange, and interest groups like the Copyright Alliance. The American Music Licensing Collective, led by a board of nine individuals with varying backgrounds within the industry, says it will enter its own broadly supported proposal. Board member Jeff Price, who founded a pair of companies to help artists collect royalties, told Bloomberg Law the coalition’s endorsements represent most of the industry’s money, not most music copyright holders. The law requires the collective to have the backing of copyright holders representing “the greatest percentage of the licensor market.” Price claims his group best meets the requirement with yet-to-be announced support from individual rights holders and music rights organizations around the world. The American Music group’s proposed board would include industry experts and technologists with expertise and a demonstrated passion for getting songwriters a bigger share of the pie, Price said. He also said they have had first-hand experience with music rights organizations and experience with existing databases. Price said his group’s board members—he called pre-submission public release of names merely “useful for a sideshow"— were selected without concern for optics or political considerations. Price said he hopes the copyright-holder support and technical know-how involved with his group’s bid can overcome the weight of the music industry. “The goal is to ensure everyone gets paid. That should be an objective that every entity, every person in the music industry is in favor of,” Price said.